The play Awake in a World that Encourages Sleep will have its world premiere in a full production in TNC’s large Johnson Theater. The actors will be Tacey Adams, Raymond J. Barry and Joseph Culp. Set and lighting design is by Markus Maurette. The play starts out as a conflict between Paul and Erica, whose son has been killed in an unnamed war. Paul had dodged the draft during Vietnam by claiming to be homosexual, but has apparently bragged to their son that he was a war hero. He is the boss of a consulting company, called the “Group,” that convinces the leaderships of underdeveloped countries to accept predatory development loans. He is a figure of both power and impotence. His wife, Erica, is aware of his secret and enraged that he would persuade their son to go to war. While they argue over their son’s death, Paul leaves the stage. Enter Edward, who works for Paul but is now quitting his highly sensitive position. The two men have been engaged in stealth operations together and there is enormous tension between them. Erica is strongly drawn to Edward. As the two men contend for her favor, the play conveys the eerie feeling that things are way out of our control. Political issues and fear of the authorities are raised amid attraction, loneliness and neediness in all three characters. The play evokes the doubt and suspicion that was born in the Iran Contra affair and continues to the present, with its fracturing of trust and its feeling of overwhelming helplessness as our nation projects its power worldwide. A small coterie runs covert operations but the assumption is that they represent all of us. Edward is aware of this; Paul is not and Erica is becoming aware through Edward’s influence. War is raging within hearing distance while our characters perch on park benches, reading Tolstoy between spurts of intense, often humorous conversation. 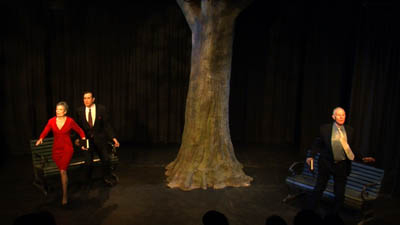 The play is stylized, orchestrated with overlapping dialogue, making use of Viola Spolin’s techniques, which the Open Theater incorporated into its theater. Non-sequitur logic establishes unpredictability in the action. Mr. Barry’s writing is distinctly Albee-esque in flavor, which he claims is a curious by-product of his work.